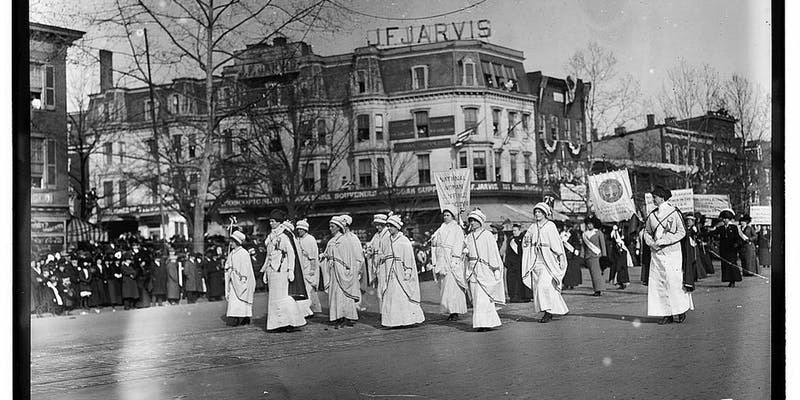 Follow the route of the 1913 Woman Suffrage Procession through DC and gain an understanding of the suffragist struggle for equality and the right to vote. The American woman suffrage movement is recognized as officially starting in 1848, at the Seneca Falls Women's Rights Convention in New York. Over the next 72 years, generations of activist women (and men) worked tirelessly until the 19th Amendment was adopted. It took the efforts of a wide range of women, from the most radical advocates of male and female equality, to women who saw the right to vote as necessary to more effectively advocate for moral and social reform. Their efforts to succeed set the stage for grassroots efforts to come, proving that determined citizens can achieve change.